So we’ve heard about the Kindle Fire; we probably know that Amazon products are designed to sell you something else; and we can infer that Fire may possibly be a lose money deal for Amazon – yet they will still reap a profit. Now Amazon has played its open secret to another level: $50 Fire Tablet. $50 Fire Tablet vs ipad would be difficult, but here’s the breakdown. The new $50 Amazon Fire cheap tablets are just about as barebones as it gets. It runs the latest version of Amazon’s Fire OS (a heavily-modified version of Android Lollipop) on a fairly mediocre 7-inch screen with huge black borders on every side. There’s a 1.3GHz quad-core MediaTek processor, 1GB of RAM, and 8GB of storage (with microSD slot for expansion). Amazon revealed three tablets on Thursday, including the thin, brightly colored 8- and 10-inch Fire HD tablets and a $50 7-inch Fire tablet that could perform on par with last year’s top-selling $100 tablet. The existence of the $50 cheap tablets was first reported in the Wall Street Journal. The biggest news on the $50 cheap tablets is the price, but in a closed session, Amazon demonstrated it alongside competing sub-$100 tablets, to show how its 1024×600-pixel screen was of higher quality, and its 1.3GHz quad-core processor (plus 1GB of RAM) meant superior response and graphics. A few other hardware perks are a MicroSD slot and a battery that lasts a tolerable 7 hours. David Limp, Amazon’s senior vice president of devices, said that it could perform about as well as, and in some ways possibly better than the 6-inch $100 tablet. 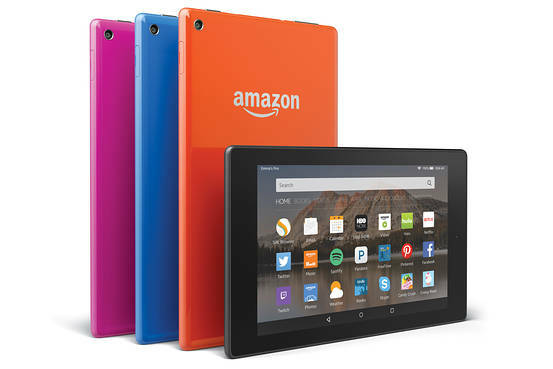 There may be an even broader audience for the Fire HD tablets that Amazon showed off. They’re pleasantly thin, and encased in colorful plastic, making them feel like everyday media companions. Both the 8-in. and 10-in. screens have a resolution of 1280×800 pixels, and there are quad-core 1.5GHz processors and the latest and most efficient flavor of Wi-Fi, 802.11ac, inside. They also have MicroSD card slots, and their batteries last up to 8 hours. Importantly, these cheap tablets have comparatively low pricing: The 8-inch Fire HD will cost $150 and the 10-in. model costs $230. (Apple’s least expensive 7.9-in. iPad starts at $269. Its lowest-priced 9.7-in. iPad starts at $399.) Amazon did not refresh its more premium HDX tablets this season. Amazon continues to tweak its FireOS modified Android interface. It now has a side-to-side navigation that lets you jump from books to videos to games. It’s still focused on content consumption, especially content from Amazon’s own digital media store. All of the new tablets—along with HD and HDX tablets released in 2014, via a coming firmware update—will have the new FireOS experience. The new Fire and the Fire HD tablets will even get a modified version of the Mayday tech support feature: If you call tech support, representatives will be able to access your device and share the screen, in order to fix a problem or demonstrate a solution. Perhaps the most interesting new feature, however, is Word Runner. It’s a speed-reading mode that shows you one word at a time, at a pace you can control. It seemed a little disorienting in the demo, but Amazon says it has been demonstrated to improve reading time. It will be available for most English-language Kindle books. Everyone knows that Apple is the only company making any real money in the smartphone business these days, and while it is making a lot less from its iPad range, it is still making more than anyone else is from tablets. Comparing amazon’s $50 cheap tablets vs ipads is like comparing, well, apples and oranges. Indeed, their content and device strategies are at the opposite ends of the spectrum, as different as their respective bottom lines. Amazon’s Fire Cheap Tablets are not going to allow you to access most of Android apps, since you cannot access the Google Play Store. What is included though is Amazon Underground – which provides you free access to apps that Amazon curates. However, do expect to be unable to use your favorite productivity app. Apple sells a premium device and experience at a relatively high price with high margins, making money from both hardware and content. Amazon is selling ultra-budget cheap tablets, at close to zero margin, banking on content to bring profits — they persuade users to sign up for the $99 Prime service, giving them access to streaming music and video services on the tablet. They’re selling you a cheap razor in hopes you’ll buy blades for a good long time. Amazon booked $92 million in profit — a rare profit, actually — on $23 billion in revenue in the second quarter. Apple, on the other hand, reported a net profit of $10.7 billion on $49.6 billion in revenue. It’s a tale of two tech giants, one that makes gobs of profit and one that makes hardly any. But who will win long-term? This approach is not new for Amazon. The company has been selling its Kindle e-reader at close to cost price for almost eight years now, yet it is a huge success for the company, allowing them to sell millions of e-books. It also provides a lock-in to Amazon’s e-commerce ecosystem, through Prime. It has tried to do the same with its Kindle Fire tablets, launched four years ago, but with much less success. While Amazon’s cheap tablets are based on Android, you don’t get access to any of Google’s services such as Maps, Gmail or — crucially — the Play Store on the devices. Instead you get Amazon’s own Fire OS, which comes with access to Amazon’s own app, music and book stores, its shopping app, and access to the company’s Instant Prime video streaming service. While Amazon’s Fire cheap tablets to date have been priced pretty aggressively, the $50 Fire tablet takes it a step further. At $50 Amazon lowers the barrier to purchase significantly — so low that buying one almost becomes an impulse purchase. Amazon is betting that, as with its Kindle e-reader, tens of millions of people will look at the price and think that it’s worth taking a risk. Amazon will hope that by appealing to the masses it will get enough people on board in sufficient numbers to generate profits from selling apps, books and videos as well as boosting its Prime membership subscription. There are, however, some issues with Amazon’s business model. Unlike the Kindle e-reader, the experience of using the new $50 tablet may not be what people are hoping for. The new Fire cheap tablets simply cannot match the iPad in terms of build quality or the amount of tablet-optimized apps available. In order to get people paying for content, people first have to want to use the new Fire cheap tablets, but with Amazon’s Fire OS software not being the most intuitive, this could be an issue. The Kindle e-reader succeeded because it did one thing brilliantly: It allowed users to carry around a whole library while only needing to be charged once a month. While Amazon may get a lot of people to buy the cheap tablets, the real challenge will be keeping them long enough to sell them mega-content.